An amusing tweet appeared at the start of this year “All the gym bunnies moaning about the newbies. Get over yourselves. You didn’t see us moaning when you came to use our pubs in December.” Of course, the inference here is that the newbies won’t last, the gym will go back to normal by week 3 of 2016. As they say, “many a true word is spoken in jest”, so it got me thinking about motivation and how to sustain that initial burst of enthusiasm to develop a motivational strategy that lasts well beyond a 30 day trial membership. I’ve been really happy with the changes I’ve made to my health and fitness, a process I started towards the end of 2014 and have continued ever since. It started with a photo someone took of me while I was delivering a talk. And I didn’t like what I saw. I committed to doing something about it, so with a vague notion of “looking better in a suit”, I started running again. I say “running” though my first attempt could best be described as a “shuffle” round the local park. Yet as painful as it felt, I enjoyed having done it and resolved to just being better next time. The simple process of being slightly better each time and seeing an incremental gain in my performance has been my focus and it’s kept me going to the point of now running 10-11 miles regularly with a half marathon arranged in May. In short, I feel almost as fit as I was when I was 21 years old! 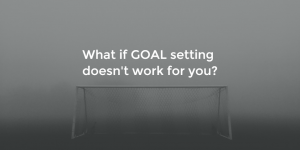 Now this flies in the face of the commonly accepted theory that we should all set specific and challenging goals for ourselves in order to improve. Note the absence of a defined Goal in my case, certainly not a SMART objective in sight and clearly not broken down into a plan with measurements attached. It’s a strategy I’ve noticed working in other aspects of my life too. Speaking to personal trainer and good friend of mine, Steve Cooper of SWEAT Fitness, we explored my approach and wondered if there may be different preferences at work here. If you want to, you can hear us chatting about this via a Podcast Steve kindly recorded. What if, in certain contexts, for certain people, those specific, measurable and stretching Goals might be counter productive? So for everyone who has promised themselves a “New Year, New Me” with a big audacious goal attached and may be finding things a little tough 3 weeks in, here are 7 ideas that just might help you take that resolution into February and beyond. Aspirations: a goal of sorts but make it meaningful. Losing 2 stones is meaningless, it’s what it will give you that’s important, whether feeling great on your wedding day or being able to run about and play in the garden with your kids. Focus on that. Find something that will enable you to be at your best and works better for you. I know I am a terrible swimmer and get bored in the gym. I used to run a bit and have always found that easier = running for me. Seek and focus on enjoying it. OK, we already know it’s going to be painful at times, so look beyond that and pay attention to the pleasure it gives you in return. That’s both while you’re doing it (you can find it) and in the huge rush you enjoy post activity. Enjoy the process. Find others to do it with. One of the biggest steps for me was joining our run club “Dockside Runners” and the camaraderie and sense of belonging is hugely motivational in terms of just showing up. Notice what is happening as you keep at it. Notice the changes that are happening both physically and mentally. This is a form of mindfulness. Simple things like the way you carry yourself or how you deal with life situations, just pay attention to those changes because they are significant. Seek reward in the incremental gains and notice the general trend of improvement. This helps deal with setbacks or off days if you know you are simply getting better over time. Reinforce your identity as the new you. Whether you are a gym bunny, a runner, a dancer, a swimmer, a great thing you can do is invest in it. I’ve enjoyed spending money I might have squandered on less worthy pursuits on new running gear and I took immense pleasure in being awarded a “Runner” t-shirt by my club. I am a runner. There you have it, I hope these strategies might help someone, somewhere become just a bit better each day, each week, each month and each year. If you have any comments or suggestions I would love to hear them. What has your experience been? Remember this is context driven and I’m not discounting those big audacious GOALS entirely. These have also been part of my own development and that of my business. Decide for yourself which strategy is most motivational for you and go from there. Enjoy being better! What is most likely to motivate you: a specific goal based strategy or one based on enjoying the process and noticing incremental gains? What will you do to be more “mindful” and pay more attention to the positive changes taking place? Great article from No Guru. No one size fits all. Great article John. I find earlier morning H visualization has helped me stay on track.